As promised, I’m back with another weekly blog post. Today I’m going to be talking about my favorite natural products. Unfortunately in today’s world, most of the products we use for beauty and our feminine health are not natural. They are filled with horrible toxins like aluminum, sulfates, and even some carcinogens (cancer causing agents). And most of these products are name brand companies that we automatically trust because of the name. But as I’ve done my own research while trying to be a healthier human being both inside and out, I realized that most of the products that I was using daily in my routine contained some not so great ingredients. Now look, I’m not a crazy health nut who only uses products that have been handmade, but I do make sure to support smaller businesses that use natural ingredients for the most part. So let me give you all the tea on what I use right now. 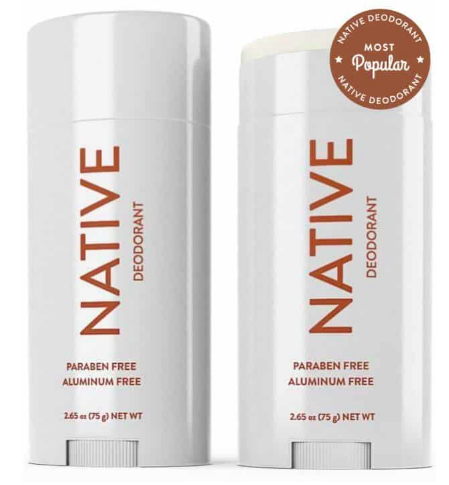 Native deodorant is a natural deodorant that does not contain any aluminum. I was looking for a deodorant with aluminum because of the health risks tied to it. Apparently aluminum increases the risk of cancer and with deodorant being applied near the breast area, I believe it has been linked to breast cancer. At first, I was skeptical because I sweat a lot and sometimes can get a little musty. I thought that natural ingredients wouldn’t be able to handle by B.O. effectively, but to my surprise, Native works wonders! I barely sweat even when working out, and when I do, there is rarely a smell. The only time I have a little B.O. is if I haven’t applied the deodorant in more than 12 hours and I’ve been sweating in my sleep. They have awesome scents and they also have them for men. Click here to visit their site. Castile soap is not your typical soap because it is comprised of oils. It’s completely natural and leaves the skin feeling nice and moisturized. It does lather and have a nice slip to it. I used to even shave my legs with it. LOL. Shea moisture and Dr. Bronner’s have castile soap or you can purchase the store brand. I love it, BUT it is extremely expensive and doesn’t last long. It’s about $7 for the small bottle and about $13 for a large bottle. On average it would only last me about three weeks because of how much I had to apply to my loofah each time. If you don’t mind dropping the cash, then I highly recommend it. For my ballin on a budget sistas, I suggest Raw Sugar. I found it at Target for about six bucks. It comes in a 25 fluid ounce bottle and lasts for quite a long time. I started using it about three weeks ago and I am nowhere near reaching the bottom of the bottle. I really like this body wash as well. It is made of all natural products that derive from plants. They even donate a bar of soap to people in need for every product purchased. One of the last products I converted to natural is my toothpaste. I am extremely picky about my toothpaste. I need my breath and teeth to be right! OKUURRRR! But who said just because it’s natural it still can’t get you right? I was totally wrong. I love Tom’s. No super strong minty taste, but my breath is always fresh and my teeth always feel clean and look white. Tom’s does not have fluoride in it, which is another ingredient that may not be the best for us. And the craziest thing I’ve noticed is that I don’t really have morning breath anymore. Good looking out Toms! I got my toothpaste from Target, but I’ve also seen it at Walmart and Trader Joe’s. Price? It’s a little on the pricey side (around $5) but it comes in a big tub and is worth the cost for me. Need a good tampon that isn’t filled with tons of chemicals and synthetic cotton? Try L. The brand is sold in Target, but I am a part of their subscription program. I pay $7.99 a month for two packs of tampons and they are shipped right to me. You can choose how many tampons you want each month and what kind based on your flow. They also donate tampons to girls when you purchase from them. I love this brand. My periods are seamless using these tampons. I’ve never had a leak, and they are so soft. Inserting them takes a bit to get used to, but I feel so much better know that I am not putting chemicals into my body. They also have pads, liners, and condoms. ALL natural. Well, I hope these natural product recommendations helped! My next stop is to go natural with my skincare routine!